She studied veterinary medicine in her native Taiwan before moving to the United States to pursue scientific research, earning a Ph.D. exploring the molecular biology of leukemia. While investigating cell cycle regulators as a postdoc with Ed Harlow, she came upon a puzzling protein called CDK5. Tsai found that, unlike related proteins with vital functions throughout the body, CDK5 was active only in the brains and developing nervous systems of mice. Tsai has since become a leading researcher in the field of learning and memory. Her laboratory has continued to explore the activities of CDK5, including its role in Alzheimer’s disease. Tsai’s work is yielding insights into the mechanisms of neurodegeneration, pointing to new possibilities for the treatment, and perhaps even prevention, of Alzheimer’s and other neurodegenerative conditions. Reflecting on her transition from a postdoc in cancer biology, Tsai says she “still finds it incredible” that she received multiple job offers to study neuroscience. In 1994 she became an assistant professor at Harvard Medical School, and in 1996 was selected as a Rita Allen Foundation Scholar. The award helped to lay the foundation for her independent research program, she says, as her laboratory built on a key discovery she had made as a postdoc: that CDK5 is active in neurons due to its association with a “coactivator” protein called p35. Tsai and her team went on to show how CDK5 and p35 interact with systems that enable neurons to migrate and grow new connections. Later work showed that p25, a smaller form of p35, accumulates in the brains of Alzheimer’s patients, leading to a “hyperactive” CDK5 that disrupts the shape and functioning of nerve cells. Tsai moved to the Massachusetts Institute of Technology in 2006. Along with further studies on CDK5, her laboratory developed powerful mouse models for understanding the mechanisms of learning and memory—including pathologies that disrupt these mechanisms and pathways to restore them. In 2016 her lab caught the attention of colleagues and the popular press when they reported that a visual stimulation technique using flickering LED lights could reduce beta amyloid plaques in a mouse model of Alzheimer’s. The plaques are clumps of protein in the brain that contribute to neurodegeneration; Tsai’s team found that the light treatment induced brain waves, or gamma oscillations, at a specific frequency, which reduced the formation of new plaques and prompted the brain’s immune cells to clean up existing plaques. Since 2009 Tsai has served as director of MIT’s Picower Institute for Learning and Memory. In 2016 she was honored by the Society for Neuroscience with its Mika Salpeter Lifetime Achievement Award, recognizing her research achievements as well as her work to advance women in neuroscience. 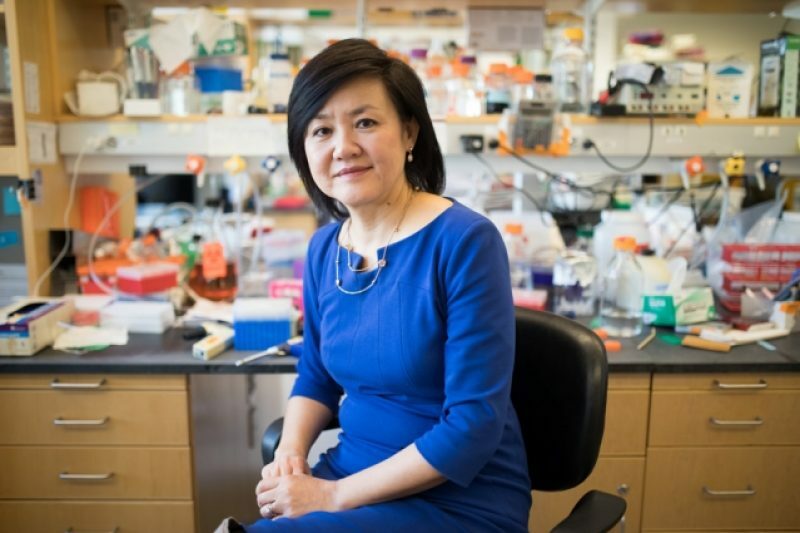 Here, Tsai shares some highlights from her career, and considers prospects for progress in targeting Alzheimer’s and continuing to unravel the brain’s mysteries. How would you sum up your most meaningful discoveries since you started your lab? In terms of CDK5, we’re very pleased. Now many other groups are working on CDK5, and it’s recognized as one of the major protein kinases regulating synaptic function in the nervous system; it phosphorylates [regulates] a plethora of neuronal proteins. Many of them are presynaptic and postsynaptic proteins, and CDK5 regulates different kinds of plasticity, including homeostatic plasticity [by which neurons “tune” their activity levels to a neural network]. We have generated all kinds of CDK5 mouse models, including conditional knockouts and cell type-specific knockouts that show very severe and distinct phenotypes. We also created a p25 mouse model to model neurotoxic or neurodegeneration conditions; this showed that p25 really is a very toxic protein for neurons. The mouse models show very severe neurodegeneration with a number of Alzheimer’s disease-specific features. And recently the connection has become even more clear: It’s not just at the phenotypic level that the p25 mouse model mimics Alzheimer’s disease. All kinds of “omics” analyses—RNA sequencing, transcriptomics, epigenomics—make it clear that the CDK5 model shows a considerable resemblance to that of human Alzheimer’s disease. Over 20 years I think we have come a long way in understanding the function of CDK5, both in physiological conditions and in pathological conditions. My lab also has made contributions in many other aspects of neuroscience. We look at the epigenetics of neurons during neurodegeneration, and we have identified pathways that manipulate epigenetics to ameliorate the symptoms and pathology of disease. And most recently, we used initially optogenetics and then noninvasive sensory stimulation to induce oscillations, or brain waves, that turned out to have a huge impact on the behavior of cells and the pathological features of Alzheimer’s-related diseases. We have come a long way in trying to understand the brain. How are you following up on the results you’ve seen with this noninvasive sensory stimulation? We are very excited about these oscillations because it’s so noninvasive and it’s so unexpected. In the original study we used visual flicker stimulation to induce oscillations in the brain; we want to know whether we can use other sensory modalities to induce these oscillations. And we want to know whether the beneficial effects that we showed in the 2016 study can go beyond the primary sensory cortex to other regions of the brain that are more involved in learning and memory, as well as other higher-order brain functions. Also, we really want to understand why this is so beneficial. We want to understand the mechanism, so we have some idea of how to go about testing whether oscillations affect the function of other cell types in the brain. In the original study we showed that the gamma oscillations have a huge impact on the function and morphology of microglia. Microglia are the brain’s immune cells, so how do the neurons communicate with immune cells? There are a lot more questions that we would like to address. And then obviously, we’ve seen a lot of beneficial data and all kinds of approaches in mouse models, but in the end the question is whether this can be translated to humans. I’m not a physician, but I’m collaborating with colleagues who are more experienced working with human subjects to try to see how translatable this can be. What developments in neuroscience are most exciting to you, and where does the Picower Institute fit in? I would say this is a golden era for neuroscience research. All the new tools that have been developed are making studying the brain much more accessible: all the labeling techniques and optogenetics and all kinds of new technology to stimulate the brain noninvasively. One can ask very specific questions to probe neural circuits and connect the functions of specific cell types to specific behaviors. Eventually I think computational modeling is going to be very important, too. At the Picower Institute we want to understand, initially, what’s the mechanism, what’s the process of memory formation and retrieval. Now it’s down to which part of the brain is responsible for generating and maintaining of which kind of memory, and different kinds of behavior. We are very excited about all the faculty we have recruited. Right now, we have 14 principal investigators, and they use different systems to address these important questions. We have model organism people using C. elegans or Drosophila, all the way to people using non-human primates. We are an institute with a very defined interest, and we have outstanding faculty members.